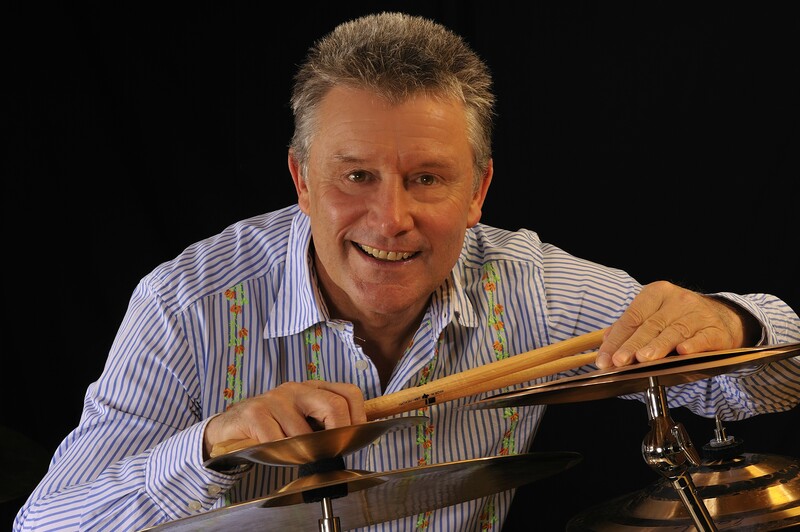 Renowned rock drummer Carl Palmer makes music with drumsticks and creates artwork with them, too. He’ll be showing off both talents at the Narrow’s Center for the Arts in Fall River, Mass., this Sunday, May 5th, as he and his band will celebrate the music of Emerson, Lake and Palmer (ELP) during a two-hour performance. The show is part of his extensive world tour, “Twist of the Wrist,” also the name of his fine art collection, which features a series of visual images constructed by capturing the rhythm of drum performances through photographs. The images, crafted in conjunction with California’s Scene Four Art Studios, combine motion, color and LED lights. He uses what he calls “special drumsticks” that emit four colors: blue, green, yellow and red, while playing drums in a dark room. The scene is photographed and then printed on canvas. Each print is signed and numbered. His art will be showcased, as well as available for purchase, during the performance at the Narrows. A meet and greet will follow for anyone who has purchased a ticket to the show. “Decade” pays homage to the fact that Palmer began playing ELP hits as a power trio, replacing keyboards with electric guitar, more than a decade ago in 2001. The DVD captures a multi-camera video shoot recorded at Pittsburgh’s MusikFest in 2011 and features Bielatowicz, who has been performing with Palmer since 2006, and Fitzpatrick, who came on board about three years ago. Palmer is grateful for the enthusiasm they bring to the band and is happy they help deliver his fresh take on ELP to fans of all ages. Palmer, best known as a founding member of ELP, as well as ASIA, has been performing for more than 40 years, taking on new projects such as the power trio and artwork to keep things interesting and fresh. He doesn’t plan on slowing down anytime soon. Even a serious bout with E Coli, which sidelined him for more than two months and caused the cancellation of ASIA’s 2012 UK tour, can’t hold him back. It was the first time one of his tours had to be cancelled in his professional career. Currently, Palmer has been on tour with his ELP Legacy since February. The tour kicked off in Japan before Palmer and his crew hopped aboard a Caribbean-bound cruise ship during the last week of March for Cruise to the Edge, which featured ELP Legacy, YES, Steve Hackett, and UK. After the cruise, Palmer toured South America before beginning his North American leg earlier this month. So far, it’s been smooth sailing. The Narrows Center for the Arts is located at 16 Anawan Street in Fall River. Tickets can be purchased online at www.narrowscenter.org, by calling 508-324-1926 or in person at the box office Wednesday through Saturday, noon to 5 p.m. Tickets will also be available at the door on the day of the show.